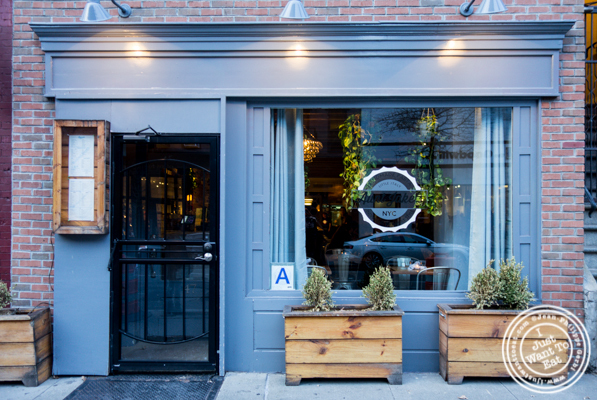 I often crave Italian food, especially pasta, and was glad to discover Aunt Jake’s Wine Bar and Pasta Lab in Greenwich Village. I am sure we passed in front of it several times, unnoticed, until I found it on Opentable. Crowded for a Wednesday evening, a reservation was needed and people without one were turned away. We sat at a table, but I admit that my eyes keep looking at the counter where one guy kept making pasta over and over, wondering if he would not get bored at some point. Yes, they propose fresh pasta at Aunt Jake’s and I like the fact that you can make your own dish, choosing first the pasta (fettuccine, tagliatelle, cavatelli or rigatoni to name a few), and then the sauce to pair it with (marinara, arrabbiata, meatballs, all vodka, etc. ), making each visit different. Of course, you can pick a specialty dish like I did: I opted for the squid ink fettuccine all vongole, a fusion of two of my favorites: squid ink pasta and all vongole that is clams in a white wine sauce. Although I would have preferred the pasta al dente (they probably cooked it 1 minute longer than what I would have liked), it was a succulent dish: with lots of medium size clams, the sauce was delicious; so was the pasta. Jodi chose the fettuccine with marinara sauce that was also quite good. 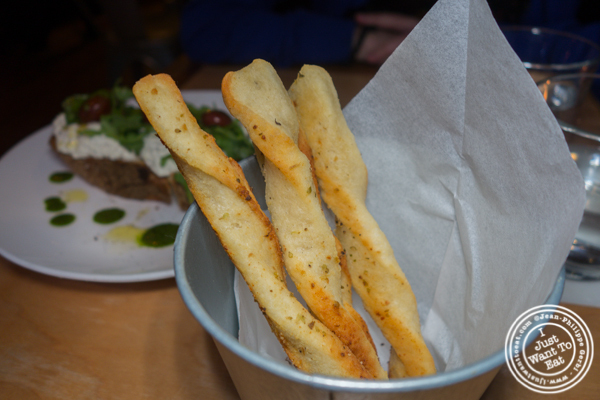 We could not not try an appetizer that was served with their homemade garlic breadsticks (ask for it: it is very good). Our choice was the burrata “stracciatella” that was served like a big bruschetta made with a rustic bread, topped with cheese, roasted tomato and a basil tapenade. Not your regular burrata for sure, but still good If like me you like cheese. I should mention their cocktails: they have few like the thunderbird I tried, made with scotch, lemon and jalapeño for some spiciness, or you can build your own by choosing a spirit, then a flavor profile (sour, bitter, sweet or spicy) and an ingredient (fruit, produce or syrup): they will do the rest. Playful, you may endup with a nice creation! We skipped dessert as we were full and thinking that we would have to go back, the food being very good and the service on point despite the crowd. 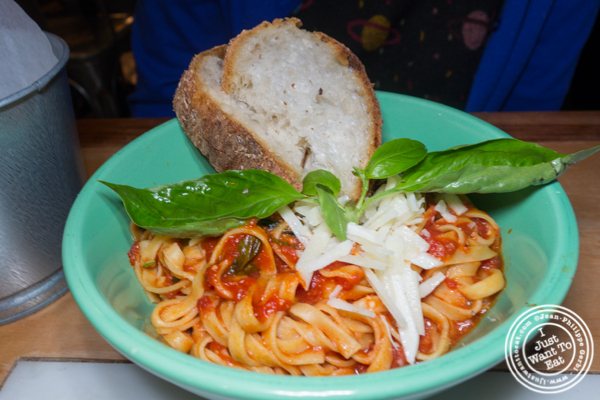 If you are craving fresh pasta, Aunt Jake’s is the place to go to, but do not forget to reserve your table: you will not regret it! I should mention the pasta lab: they give classes if you want to know how to make pasta. For $35 including eating the pasta, they propose a good deal.